If you garden and raise chickens, you can forget about having to buy Miracle Gro or fertilizer ever again. 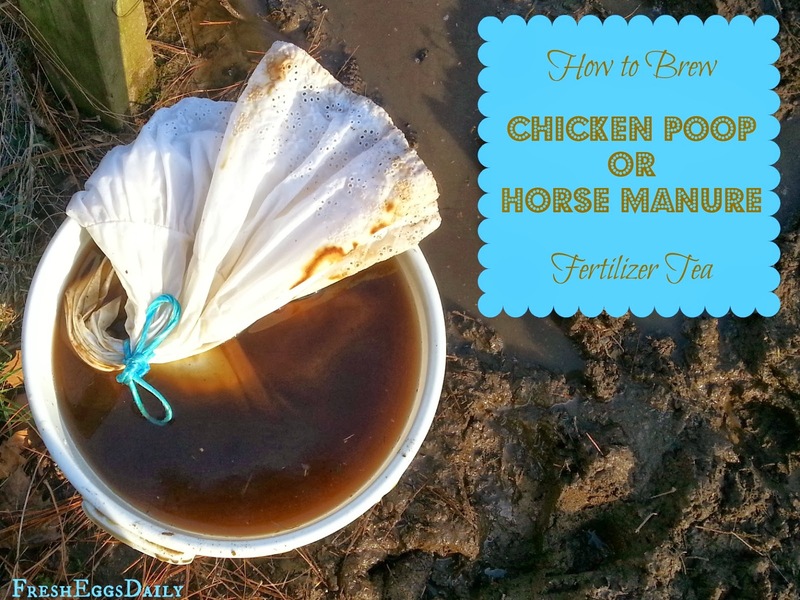 It's so easy to make this Chicken Poop Tea to fertilize your gardens! We use the Deep Litter Method of overwintering the coop bedding, which is an old-timer's method of composting the chicken manure all winter right in your coop. Then in the spring, you just clean it all out and add it to your compost pile. We also compost our horse manure, so when its time to prepare my vegetable garden, I have piles of composted soil at my disposal. But this year I decided to step it up a bit and brew a batch of manure tea to help add more nutrients to our garden soil. I've been preparing the garden for planting for the last week or so, and it's a perfect time to give the soil a drink of nutrient-rich tea. A form of compost tea, manure tea contains beneficial microorganisms, bacteria, nematodes, enzymes and organic matter that you want to add to the soil. Unlike compost tea however, the goal in brewing manure tea is not to increase the good bacteria or multiply microorganisms, but merely to pull the nutrients out of the manure and dissolve them into a liquid 'tea'. 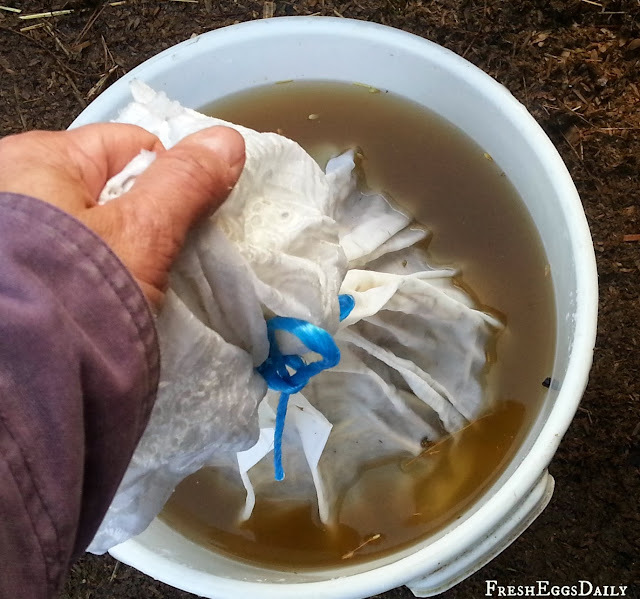 Therefore, the brewing method for manure tea is fairly simple and doesn't take long at all. Chicken manure is about the best source of nitrogen and other nutrients, and has one of the highest NPK (Nitrogen-Phosporous-Potassium) ratios of any manure, but horse, cow or goat manure or even rabbit droppings also makes nice fertilizer. I decided to mix up a batch of chicken poop tea and also a batch of horse manure tea since that's what we've got. 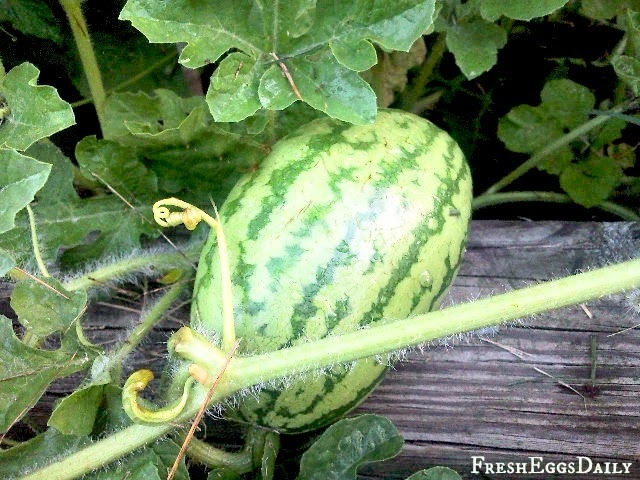 Tomatoes, asparagus, cabbage and watermelons specifically benefit from some extra nitrogen in the soil. First I made a 'tea bag' for the manure. I used two old pillowcases and filled one about 1/3 full with some chicken poop and partially composted straw from the bottom of the coop litter, figuring this was the oldest poop, having sat since September. (Because of the high nitrogen level of chicken poop, it is important that the chicken manure be aged or composted before using so it doesn't burn your plants). I filled the second pillow case with the oldest, most dried-up horse manure I could find. In the case of horse manure, it won't burn plants, but you want to use older manure to be sure that any undigested grains or seeds aren't going to sprout as weeds in your garden later. Also, there's less chance of pathogens such as E. coli being present in older manure. 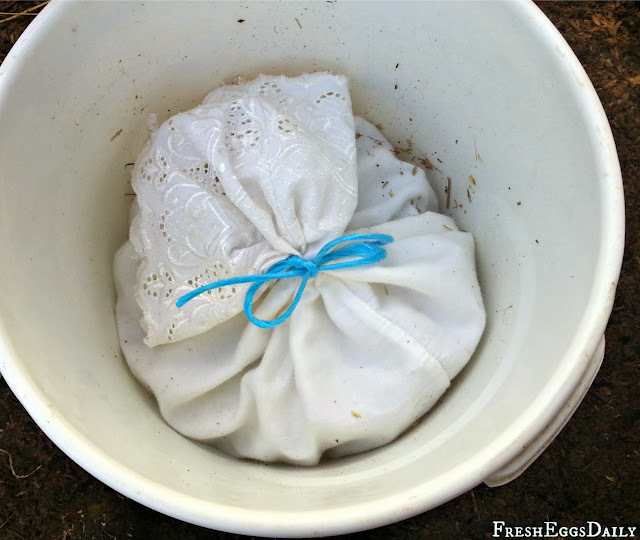 I tied a piece of pretty blue baling twine around the neck of each pillow case (manure tea can be pretty too!) and then placed each in a large plastic pail. 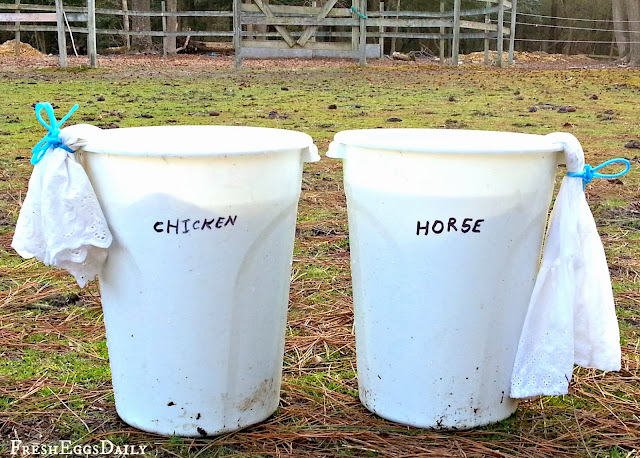 You can use a bucket, trash can, whatever....then added water, covering the pillowcase contents completely so I had approximately 1/3 manure or poop and 2/3 water. You will want to keep introducing oxygen to the solution so pathogens and bad bacteria won't grow by dunking the pillowcase up and down a few times a day. Let the pail sit in a sunny location uncovered for a week or so. Your resulting 'tea' should resemble iced tea in color when it's done. After the week is up, remove the pillowcase from the pail and empty the solid contents back into your compost pile. Dilute your tea, 1 part tea to 4 parts water and apply to your garden. 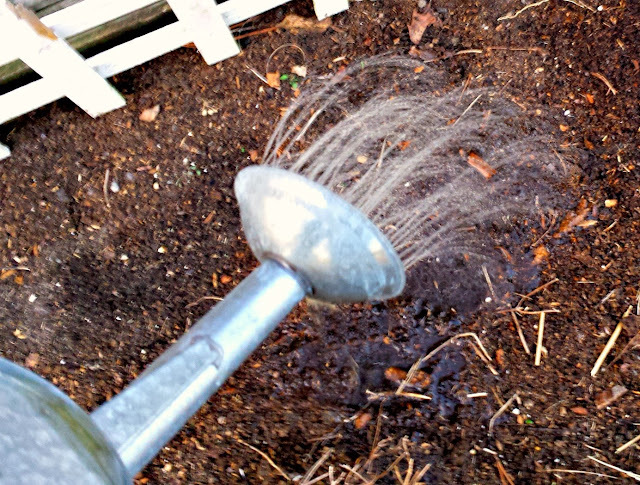 I used a watering can and applied both the horse manure and chicken poop tea to our vegetable garden. Once I plant my seedlings in another few weeks, I'll make another batch of tea and apply it to them and also sprinkle some crushed eggshells around the base of the seedlings for the added calcium. Note: Manure tea is most useful when given to young seedlings and plants for a boost of nitrogen to help them grow. Apply the manure tea once a week using a watering can or hose sprayer attachment around the base and root area of the plants until they start to flower. Because of the potential for pathogens, don't apply to root crops (such as potatoes, beets, carrots, etc.) and don't apply to leaves you will be consuming (such as lettuce, kale, spinach or other greens). Wash your hands after each use and keep leftover tea stored outside loosely covered. BECAUSE LIFE IS JUST BETTER WITH CHICKENS...AND DUCKS! thanks for sharing your tea recipe! Oh trust me! You aren't a farmer or gardener until you've had poop in your hair, under your fingernails, etc. Gross as it may seem, I"m sure seeing all the chemicals and things commercial farms use is WAY grosser! Would this work with Worm droppings? 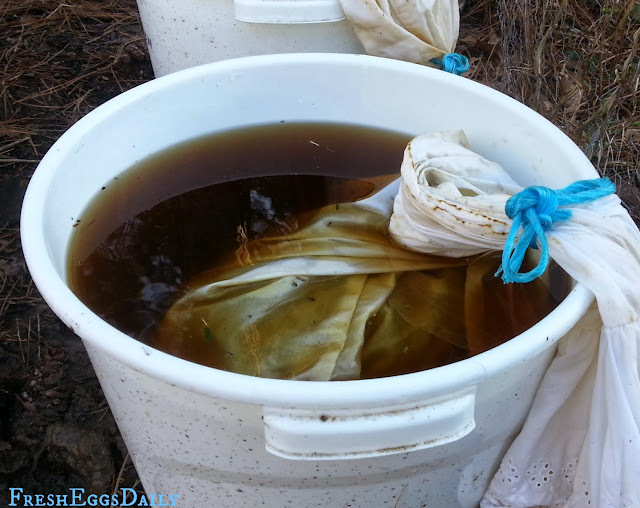 I Worm Compost and have a system that catches the liquid "worm tea." I know I have to brew it but the stuff I've seen out there for brewing goes something like this - Get a fish tank, filter, oxygen system, etc. I have a small container garden and I would love to use this for watering but don't have the room for an elaborate system to brew the tea. How do you know if the tea is too strong? I have tried fertilizer tea in the past and it burned my plants. If the chickens continue to "poop in the coop" will it still be strong even if it's overwintered? I live in California by the way so we don't have snow or even much rain! I have the same question that LoveChickens had. We use pine shavings in our run and have done the deep litter method this winter, but since they continue to poop on it, won't it still be too "hot" to put on the garden? We will not be able to plant until May, but would like to get a plan before then lol. I'm going try the chicken manure tea. I guess I can put it into a handheld sprayer and it will work? I'm wanting to spray my yard with it.